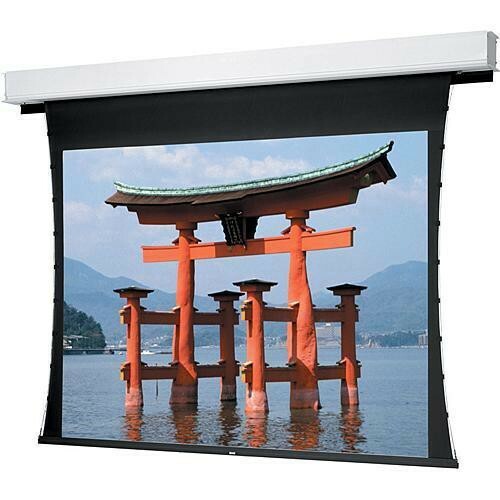 The Dalite 45 x 80" Advantage Deluxe Electrol Projection Screen is designed to have the case installed during the "rough-in" stages of construction and the fabric assembly during the finish stage. This permits you to take your time in choosing the proper screen finish for your installation. It also facilitates changing surfaces should your needs change since you will not have to remove the entire casing from the ceiling. This is a real money-saver since you will not have to purchase an entire new screen system. Its handsome white powder coated closure doors and case provide a clean look and allow easy installation of ceiling tiles. The motor is oiled for life and possess an automatic cut-off mechanism that helps prevent burnouts. In addition, the screen features a sophisticated braking system that stops the screen in either up or down position exactly where you want it. When the screen retracts behind its doors, the motor automatically cuts off and shuts down the entire system. Note: This item is ONLY wired for 220V, European voltage. The standard Advantage model (non-Deluxe) will also be ceiling recessed. However, it doesn't have the motorized door which is featured in the Deluxe model. Instead, the Standard version has a 2" slot on the bottom where the fabric drops out. Box Dimensions (LxWxH) 106.0 x 13.0 x 10.0"